Electronics (not included)The Zumo chassis uses two motors, one for each tread. The ideal motors for your robot depend on your desired torque, speed, and current draw, so motors are not included with the chassis. We generally recommend using HP versions of our micro metal gearmotors since the tracks require a decent amount of torque to move effectively; higher gear ratios of the non-HP motors might work if you want lower current draw, but they will be slower and offer less control. Specifically, we recommend the 50:1, 75:1, or 100:1 HP motors for use with this chassis. The following table summarizes the key specifications of these three gearmotors. The first four columns are specifications of the motors themselves, while the last column is the measured top speed of a Zumo chassis loaded to a weight of 500 g and driven with these motors. Note that the specifications are for 6V operation, which is approximately the voltage you would get with four alkaline batteries; four NiMH AA cells will typically provide less than 5V. The Zumo Shield for Arduino is designed specifically to act as an interface between an Arduino Uno or Leonardo and the Zumo chassis. The shield provides all the electronics necessary to power the motors and includes some additional fun components for making a more interesting robot, such as a buzzer for making sounds and a 3-axis accelerometer and compass. 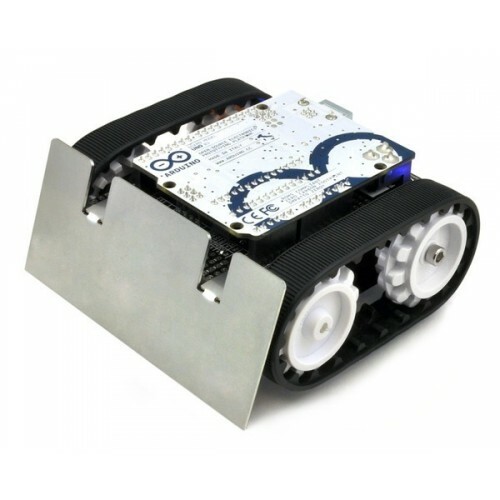 The Zumo chassis is also available as part of a fully assembled Zumo Robot for Arduino or bundled as a kit with a Zumo Shield and Zumo blade. If you are assembling your chassis with the Zumo shield, please follow the Zumo shield assembly instructions in place of the more general Zumo chassis assembly instructions. 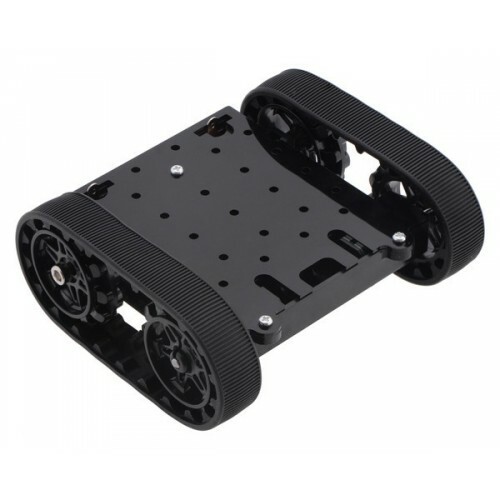 If your goal is to make a robot based around a controller other than an Arduino, we recommend the DRV8833 motor driver carrier or qik 2s9v1 for use with this chassis.Assembled Zumo robot for Arduino with an Arduino Uno. Pololu Zumo chassis, assembled front view with dimensionsSince each side is smaller than 10 cm, this chassis meets Mini-Sumo size requirements. The front screws used to mount the acrylic plate to the chassis can also be used to mount a front scoop that can extend up to 14 mm before exceeding the Mini Sumo limits. The assembled Zumo chassis weighs approximately 210 g with motors and batteries.